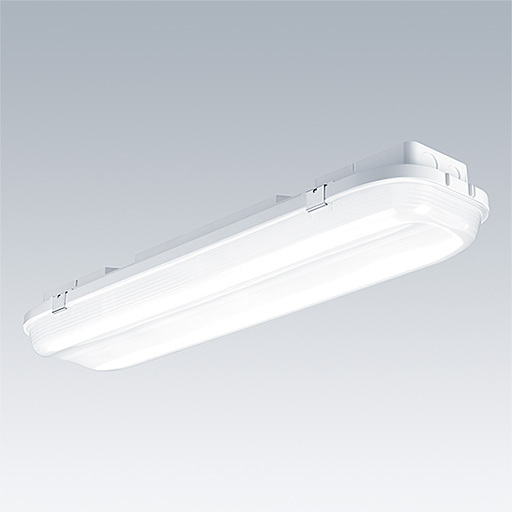 A compact IP66, dust and moisture proof LED luminaire. electronic - fixed output fixed output control gear. Class I electrical, IK10. Canopy: fully recyclable aluminium painted white. Diffuser: polycarbonate with linear prisms. Toggles: stainless steel. For surface, BESA or suspended mounting and outdoor wall mounting without canopy. Quick-fix brackets supplied for surface mounting. Mounting kits for conduit, chain suspension and catenary suspension are available as accessories. Complete with 4000K LED.